Behind exquisite form is a carload of function. No hot discussion occurred as to whether the Navigator should make the cut. Everyone agreed it belonged on the 2018 Wards 10 Best UX list. In back-to-back wins, the Lincoln Navigator lands on another Wards 10 Best list. The fullsize luxury SUV last spring took a 2018 Wards 10 Best Interiors spot. In that contest, a judge called the richly appointed vehicle a country club on wheels. Now, it’s in the winner’s circle again for the 2018 Wards 10 Best User Experiences, a competition that focuses on, among other things, human-machine interaction, advanced driver-assist technology and good old user-friendliness. In their deliberations, our judges sometimes will feistily debate whether this or that vehicle should make the cut. No hot discussion like that occurred regarding the Navigator. Everyone agreed it belongs on the Best UX list. It reflects a new height of American opulence, but behind exquisite form is a carload of function, from forward and reverse sensing systems, to an impressive 10-in. (25.4-cm) center touchscreen packed with utility, to a head-up display with the brightest and biggest windshield-projected informational display in its class. Ford’s luxury division says it designed the Navigator UX offerings to be intuitive and easy to use. Mission accomplished. A Ford executive says of the Navigator, “Sometimes the industry just says, ‘Here’s the latest technology,’ but we’re trying to put an experience on it.” Check the “done” box on that to-do list. Judges were impressed with an array of things, such as spot-on adaptive cruise control, the most realistic 3-D mapping we’ve seen yet, quick and easy Bluetooth pairing, a rear-seat entertainment system that allows passengers to stream content, SYNC3 with both Apple CarPlay and Android Auto compatibility, six USB ports, four 12-volt power outlets and a 110-volt plug. In the surprise-and-delight category, judge Christie Schweinsberg gives the Navigator an “absolute 10.” The “welcome aboard” screen imagery and ambient lighting is alluring. The former begins before you even enter the vehicle. The cost of admission isn’t cheap. The Black Label model we tested is just a few thousand short of $100,000. It’s not for people on a tight budget. But $96,150 seems relatively reasonable for getting your own country club with a ton of stunning technology included in the deal. 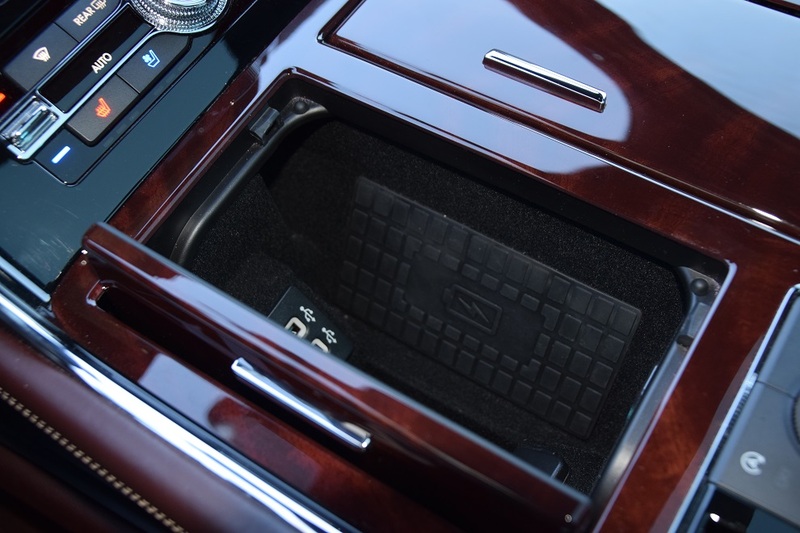 Wireless smartphone charging pad in Lincoln Navigator.